FleksCMS ™ - a flexible and universal system of creating and controlling any information of a contemporary Internet website. Management of system CMS does not require any professional knowledge. The basic PC knowledge (Internet Explorer, MS Word) is enough for the user. Besides the easy content control (informative materials, news, archives, price lists, catalogues, banners, the blitz polls, announcements, forums etc. ), FleksCMS ™ provides complete control over the structure of the website, as well as offers unlimited amount of page level inserting. Information is edited in online regime through web-interface. An installed editor (analogue of MS Word interface) is scheduled for the formatting of documents. 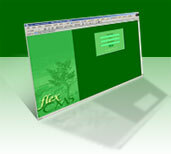 FleksCMS™ - a module system that includes in itself the maximal module kit that is necessary for managing the business of a contemporary company. The structure module offers the website administrator maximum control in work at the structure of website. Administrator has the option to add or delete sections, change the sections’ names, order in which they follow on the menu of the website; to create unlimited amount of inserted pages. There the inactive page function when the page does not need to be deleted but it does not appear on the website for a time. The installed WYSIWYG editor (analogue of MS Word interface) provides the option to add, edit and format the textual information, pictures, tables etc. on the website. It is an easy and handy to use interface that outwardly, as well as in action similar to MS Word.